Castleford Tigers Women kicked off their 2019 campaign in ruthless fashion as they steamrolled past the York City Knights Ladies. There was simply no stopping the Tigresses as they ran in 15 unanswered tries and kicked 10 goals to secure a devastating 80-0 victory. Despite the score line, it was actually York who got off to the better start. For two consecutive sets, the home side forced Castleford into defence as they piled on the pressure in the opening moments. However, the first bit of offensive play from the Tigresses saw them kick start a run of tries from which the Knights simply would not recover from. Lacey Owen was the first one to get over the tryline. Within the next 15 minutes, further efforts from Georgie Hetherington, Esme Reynolds and a second for Owen saw the Tigers extend their lead to 20-0. The away side had yet more opportunities to build on their lead, but a couple of handling errors saw two glorious opportunities go to waste. Nevertheless, Tara Stanley opened her account 10 minutes before half-time and Reynolds scored her second to close out a dominant first half. The Tigresses picked up where they left off in the second half and continued their path of destruction. Reynolds secured her hat-trick just three minutes after the restart. Then two tries in a space of three minutes saw Hetherington complete her treble. Further efforts from Lucy Eastwood, Kelsey Gentles, Grace Field and Georgia Roche put the Tigers 68 points ahead. In the last five minutes Stanley and Field bagged two more tries for the visitors to make the final score 80-0. Castleford were always expected to get the win but few anticipated the Tigresses to show such ruthlessness. Both teams last met in the Challenge Cup semi-final last year which saw Castleford claim a 40-10 win. Last weekend’s performance shows just how far this team has come. Head coach Lindsay Anfield said: “This was a good start to the season. We’re happy to have finally put pre-season to bed and get our league campaign under way. 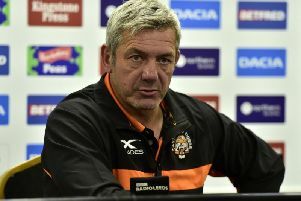 “A number of our new players got to make their Super League debuts, which was beneficial. They seem to have fitted in well. I was especially glad to see Esme Reynolds get a hat-trick as this will be a good confidence boost for her. Castleford will head into the Wigan game as the league leaders thanks to their superior points difference. Wigan, meanwhile, will be hungry for victory after suffering a 6-4 defeat to bitter rivals St. Helens last weekend.